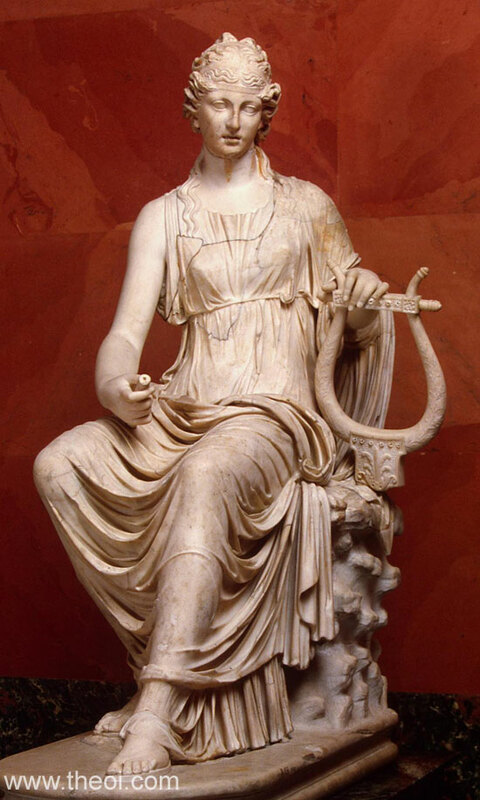 TERPSIKHORE (Terpsichore) was one of the nine Mousai (Muses), the goddesses of music, song and dance. 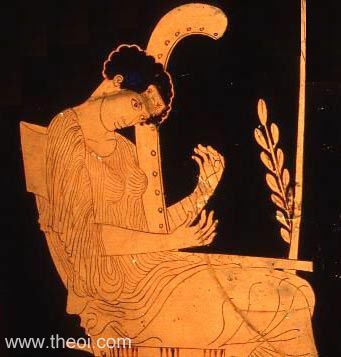 In the classical era, when the Mousai were assigned specific literary and artistic spheres, Terpsikhore was named Muse of choral song and dancing, and depicted with a lyre and plectrum. Her name means "Delighting in Dance" from the Greek words terpsis "to delight" and khoros "dance". "The Mousai (Muses) sang who dwell on Olympos, nine daughters begotten by great Zeus, Kleio (Clio) and Euterpe, Thaleia (Thalia), Melpomene and Terpsikhore (Terpsichore), and Erato and Polymnia (Polyhymnia) and Ourania (Urania) and Kalliope (Calliope)." "Then the Mousa (Muse) [i.e. the poet] had not yet bowed to love of gain, or made herself a hireling journeyman; nor in the market clad in masks of silver did honey-tongues Terpsikhore (Terpsichore) barter her gentle-voiced and sweetly sun refrains. But now she bids us pander to that word the Argive spoke, to sadly near to truth : ‘Money, money makes man.’"
"But in another song did three goddesses [Mousai (Muses)] lull to rest the bodies of their sons. The first of these [Terpsikhore (Terpsichore)] sang a dirge over the clear-voiced Linos (Linus) [personification of the lamentation song]." "Terpsikhore (Terpsichore) summons me to sing." "When they [the grasshoppers] die they go and inform the Mousai (Muses) in heaven who honours them on earth. They win the love of Terpsikhore (Terpsichore) for the dancers by their report of them." "Mnemosyne [bore to Zeus] the Mousai (Muses), the eldest of whom was Kalliope (Calliope), followed by Kleio (Clio), Melpomene, Euterpe, Erato, Terpsikhore (Terpsichore), Ourania (Urania), Thaleia (Thalia), and Polymnia." "The clear-voiced Seirenes (Sirens), Akheloos' (Achelous') daughters, used to bewitch with their seductive melodies whatever sailors anchored there. Lovely Terpsikhore (Terpsichore), one of the Mousai (Muses), has borne them to Akheloos, and at one time they had been handmaids to Demeter's gallant Daughter [Persephone], before she was married, and sung to her in chorus." To each of the Mousai (Muses) men assign her special aptitude for one of the branches of the liberal arts, such as poetry, song, pantomimic dancing, the round dance with music, the study of the stars, and the other liberal arts . . . For the name of each Mousa (Muse), they say, men have found a reason appropriate to her . . . Terpsikhore (Terpsichore), because she delights (terpein) her disciples with the good things which come from education." "Daughters of Mnemosyne and Zeus . . . Kleio (Clio), and Erato who charms the sight, with thee, Euterpe, ministering delight : Thalia flourishing, Polymnia famed, Melpomene from skill in music named : Terpsikhore (Terpsichore), Ourania (Urania) heavenly bright." "The Seirenes (Sirens), whom rosy Terpsikhore (Terpsichore) brought forth by the stormy embraces of her bull-horned husband Akheloos (Achelous)." "Linos : Of Khalkis (Chalcis), [son] of Apollon and Terpsikhore (Terpsichore), but others [say] of Amphimaros (Amphimarus) and Ourania (Urania), others of Hermes and Ourania." Greco-Roman Vichten Floor Mosaic C3rd A.D.
Greco-Roman Trier Floor Mosaic C3rd A.D.
Greco-Roman Cos Floor Mosaic A.D.
Greek Elis Floor Mosaic C1st B.C. Pindar, Odes - Greek Lyric C5th B.C. Greek Lyric IV Corinna, Fragments - Greek Lyric C5th B.C. Plato, Phaedrus - Greek Philosophy C4th B.C. Other references not currently quoted here: Alciphron Letters 1.13, Scholiast on Euripides' Rhesus 346, Suidas Rhesos.